. The entire piling process is faster, more economic and safer when the operator has the ability to see what he is doing. Lead articulation means the operator can position the leader for good visibility with minimum track movement.
. 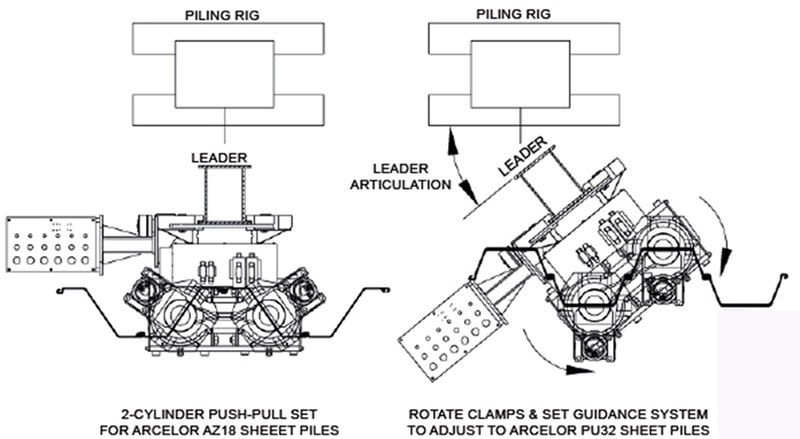 The 2-Cylinder Push-Pull unit can accomodate numerous pile profiles simply by articulating the lead and/or adjusting the rotational setting of the individual cylinder assemblies. The example below shows the same 2-Cylinder Push-Pull unit working with Arcelor AZ18 and PU32 steel sheet piles. The centres of the two Modular Hydraulic Cylinder Sub-Assemblies remains the same, but the Adjustable Guidance System is altered to correctly align the Clamp Assemblies with the clamping faces of each pile.